CHARLOTTESVILLE, Va. (ABP) — A California Baptist University women’s basketball player pleaded guilty Feb. 9 in Virginia to two felonies after hitting a construction worker last summer while driving drunk. Vitalija Vasciunaite, 22, confessed in Albemarle County Circuit Court to maiming another person while driving intoxicated and felony hit and run. A native of Lithuania, she faces possible deportation and up to 15 years in prison when she is sentenced May 31. According to media reports, her lawyer plans to request a much more lenient sentence of one day to six months in jail. She was indicted in December for hitting construction worker Jose Porfirio Martinez-Quinteros on Interstate 64 near mile marker 103 in the early morning hours of July 17. He suffered a broken leg in three places and a broken arm. He reportedly is recovering from those injuries but is still unable to work. Vasciunaite, a 5-9 junior guard at California Baptist, told police she consumed seven beers before borrowing a car to drive to Harrisonburg, where she drank 10 beers at a party before making the hour-long return trip to the Charlottesville area. She first told police she didn’t remember hitting anything, but later said she recalled striking something but didn’t think it was serious enough to stop. Her blood alcohol content five hours after the accident was .15, nearly twice the legal limit. Vasciunaite was a member of the Lithuanian under-18 national team before coming to America to play basketball at Miller School of Albemarle, a coeducational preparatory school near Charlottesville, Va.
She played her first two seasons of college basketball at the University of Miami. She transferred to St. Francis College, a Division I school in Brooklyn Heights, N.Y., and was sitting out a year because of NCAA transfer rules when the accident occurred. 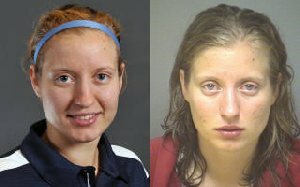 After her arrest, St. Francis dropped her from the team. John Markham, Cal Baptist’s first-year women’s basketball coach, heard about Vasciunaite on the coaching grapevine and talked with athletics director Micah Parker about the possibility of bringing her to the private Christian school founded by the California Southern Baptist Convention. The process involved researching Vasciunaite’s background, who by all accounts was regarded of good character and deserving of a second chance. It also involved some frank discussion with the prospect about the expectations of representing a faith-based university. “We had some long and very candid conversations on the phone way before we ever talked about her jumper or anything like that,” Marcum told the newspaper. In October she was accepted to California Baptist University’s accelerated program in international business. One condition was that she must complete alcohol abuse evaluation and treatment. Vasciunaite, who was raised Roman Catholic, says she no longer drinks.